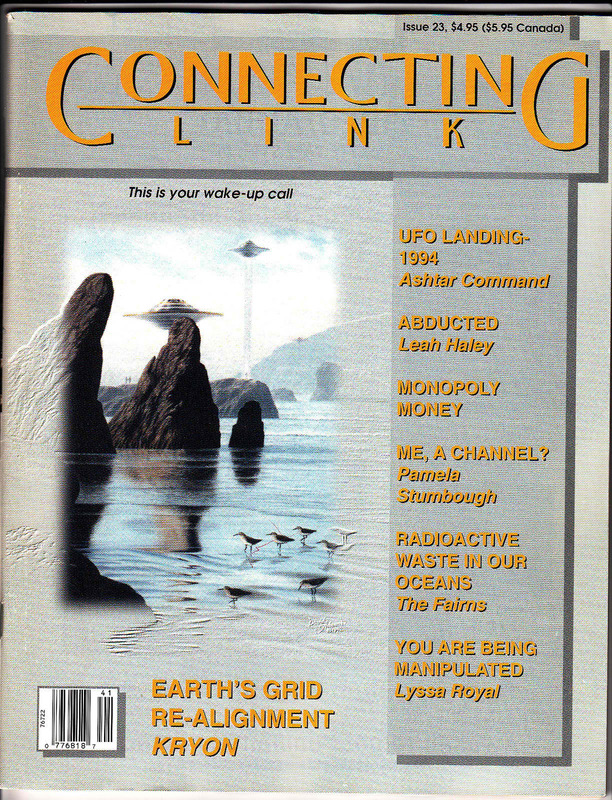 A Connecting Link magazine cover, Issue 23, 1994, depicting UFOs. Alien Encounters: The Secret Behind the UFO Phenomenon by Chuck Missler & Mark Eastman was published in 1997. At the time the book first came out it would not have been an easy task to review the book, check the facts presented, analyze the credentials of the experts who are cited, authenticate footnotes and delve into original sources. But one can do this now, and with quite a bit of ease, simply because of the vastness of the Internet. This article series temporarily interrupts the previous series, The Rise of Endtime Occultism. It begins a comprehensive review of Alien Encounters, which is still widely cited, heavily marketed, and even published online. While Alien Encounters is not the first book on the topic of UFOs to be published in the Christian world, it has become the most influential. Many of the Postmodern Prophecy Paradigm (PPP) leaders have said that it was this book – Alien Encounters – that persuaded them to believe new things about the future. Thus it has served as a foundational book for teaching an emergent postmodern eschatology – an endtime scenario that now includes UFOs, space aliens and Nephilim. Below are a few examples of the widespread influence of Alien Encounters. Tom Horn, who propelled the new prophecy movement to “full steam ahead” by his vigorous online merchandising of the paranormal, has widely credited Alien Encounters. In his book Nephilim Stargates: the Year 2012, and the Return of the Watchers, Horn says that Missler and Eastman were the men who first asked the question: who or what was “mingling with the seed of men” in Daniel 2:43. In this oft-cited question, Missler and his co-author Mark Eastman propose that a non-human species (or space aliens) mixed DNA with human beings. This same passage in Missler’s book is also cited by Terry James whose book The Departure: God’s Next Catastrophic Intervention into Earth’s History was published by Horn’s Defender Publishing. Horn brings the quote up again in his book Apollyon Rising 2012 and the Return of the Watchers, in his book Forbidden Gates: How Genetics, Robotics, Artificial Intelligence, Synthetic Biology, Nanotechnology, and Human Enhancement Herald the Dawn of Techno-Dimensional Spiritual Warfare, and again in his book God’s Ghostbusters. This Missler/Eastman quote, in the context of the other theories espoused in Alien Encounters, thus forms the central core and foundation of the new prophecy movement’s teachings. Further underscoring the significance of Missler’s book, PPP teacher L.A. Marzulli, in the acknowledgements to his work Nephilim, states: “Chuck Missler has been a source of inspiration. 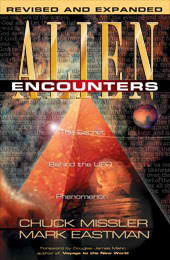 Alien Encounters is a must read for anyone wanting an indepth study of the alien phenomena from a biblical perspective.” Similarly, Doug Hamp, who wrote Corrupting the Image: Angels, Aliens and the Antichrist Revealed, discloses: “The various messages were first compiled by researcher Brad Myers who did much of the research for the bestselling book Alien Encounters by Drs. Chuck Missler and Mark Eastman.” Others associated with this same group of prophecy leaders include Peter Goodgame and Steve Quayle, who both cite Missler’s book. Noah Hutchings, who was quite interested in sensational endtime speculations during his lifetime, in a book published by Horn’s Defender Publishing, also cited Missler’s Alien Encounters as an authoritative work on UFOs. Note that most of these Postmodern Prophecy Paradigm (PPP) teachers have been enabled to spread their message via Tom Horn's various publishing endeavors. A Note About this Review: I determined to approach the book as an intently curious reader – analyzing its contents carefully, one chapter at a time, and openly considering its point of view. I was a novice regarding its subject matter, which seemed to be a good perspective from which to start. I decided to do what any avidly interested reader would do—“google” the Internet to study more about the topics, look into the book’s citations, check out the resources, investigate the experts, locate the conferences, study the publications, and review the documentation. Any curious reader could do what I did, and that is the point of this review. In the process of researching this book, I realized that I was not quite so ignorant of the subject matter as I had first thought, and that my testimony intersects with this book at a number of points. Therefore, on occasion you will learn my own story. I am especially grateful for the helpful research assistance by other members of the Discernment Research Group, especially including Dr. Martin Erdmann, Susan Conway and Gaylene Goodroad. What follows is an in-depth fact check, following along my research trail, on the subjects discussed in Chapter One of Alien Encounters. This fascinating quote is attributed to “Israeli Journalist Iris Almagor, March 1997.” There is no further citation. It appears that Missler’s use of this quote has been published on the Internet on a variety of UFO sites, and it has even taken on Urban Legend status. This was the first of many examples of Alien Encounters research becoming a self-replicating source of documentation, widely re-posted on the Internet. I would quickly learn that Alien Encounters has become very popular as a source of UFO information, and it is frequently quoted or cited on UFO lore websites. Chapter One is all about UFOs, “unidentified flying objects” or “flying saucers.” I was immediately struck by the strangeness of the subject matter. Why is this unusual topic important to Christians? The answer cannot be found in the first chapter. One of Missler’s first citations is a NASA report, “NASA Scientists Find Evidence of Life on Mars.” Missler acknowledges that there was “considerable doubt regarding the evidence,” but then he made a disparaging remark that “cynics snickered.” Since life on Mars has been the topic of hot scholarly scientific debate for decades, this didn’t seem to be a fair characterization of those who don’t necessarily agree. As I continued reading, I became aware that this type of disparaging remark could be found throughout the book. So, cynics beware! I was interested to read Missler’s perspective on UFOs. As an eminent evangelical teacher, I presumed that he would take a cautious approach on the subject, maintaining a biblical focus and relying on scholarly science. I was therefore quite shocked when I researched the next section where Missler discusses UFO appearances over Mexico City in 1993. Missler cites a 1994 article by Brit Elders in Connecting Link magazine. 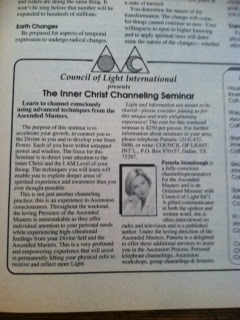 I wanted to learn what Connecting Link magazine was all about since I’d never heard of it, so I googled it. 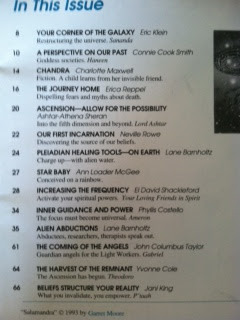 I discovered that it was a New Age magazine which focused on UFO topics. I was so amazed that Missler used this magazine as a credible source that I even purchased an old copy of it from a used bookseller online. The exhibits in this post come from advertisements and articles published in Issue 21 of Connecting Link published in 1993, and the cover at the top of this post is from Issue 23 in 1994. At this point, wanting to give the benefit of the doubt, I assumed these strange citations by Missler were just an anomaly. 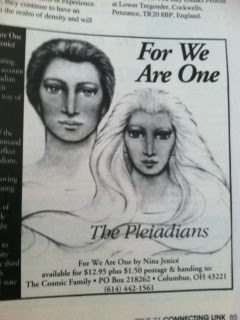 But then I found a Connecting Link article, “Conversation With The Pleiadians,” which purports to be a transcription of an actual channeled Pleadian transmission to earth via Barbara Marciniak. The channeled messages are about teaching humans change their belief systems, expand their mind, cultivate “energies,” develop an “aura,” tap into the “Universal Mind,” and find their “Higher Selves.” This is very obviously New Age! Why would Missler quote from this? Curiously, the title of this transcribed channeled Pleiadian tape is “What Is Going On,” which is reminiscent of Missler’s chapter one title, “What in the Cosmos is Going On?” As I kept reading I discovered that Missler refers to the Pleiadians later in his book, including the channeled communications via Barbara Marciniak. The point in mentioning all of this is that Missler cites this magazine four times as though it is a credible source of UFO information. Since when are any “channeled” transmissions reliable and honest sources of credible information? The New Age content was very evident! I kept hoping to see Missler issue some sort of disclaimer, a warning to believers, or even a rebuttal, but it didn’t happen. So I kept reading, hoping that this was just an accidental or one-time oversight. Missler next refers to UFOs seen over Israel in 1996. He quotes from a “British Journal UFO Reality” as an authoritative source. A online search revealed that “Issue 6” cited by Missler was titled “The Big Invasion,” referring to space aliens. Other issues of this periodical talk about strange UFO events with such titles as “UK UFO Crash,” “The 19th Parallel,” UFO’s Over New York,” “Chinese Pyramics,” and “Crop Circle Special.” This did not sound like a credible periodical. Missler also cites Barry Chamish who during the 1990s was a leading UFO researcher in Israel. Footnote 19 refers to a Cleveland Plain Dealer newspaper account, although no article title is provided in the footnote. However I did locate it online. I began to notice a pattern developing. Many of the footnotes and other references in Alien Encounters were incomplete. Was this intentional or just sloppiness? I worried that it might be on purpose considering the controversial nature of some of Missler's documentation. Keep in mind that in 1997 it would have been nearly impossible for a reader to locate the remainder of an incomplete original source, but in 2013 I could usually fill in the blanks by googling information online. Perhaps this seems unfair, but since the book is still widely published and listed all over the Internet as an authoritative source, this is something that any reader could do. My point in following the research trail was also, I must confess, to see if it would lead the reader to hear the Gospel of Salvation. Sadly, I did not find it in the first chapter. By this time in the book I was wondering why so much time was being spent on recording the various UFO sightings around the world. What does all this have to do with the Gospel? With Jesus Christ? It seemed very far removed from anything Christian. And the credible sources relied upon by Missler seemed to be getting more incredible each time I turned a page. The Korea UFO sightings described on pages 20-21 of Missler’s book were not footnoted but a search online revealed that some of the accounts can be found on UFO lore websites. Missler concludes this section by noting that the Korea story was “reported by mainstream media.” Indeed, when UFO sightings are reported in mainstream publications, it does give it an air of legitimacy. But elsewhere Missler was using some pretty strange sources! 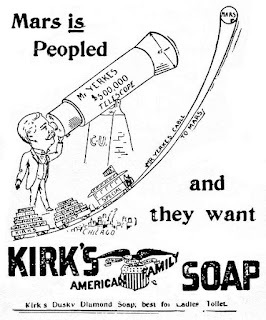 A typical New Age ad in Connecting Link, Issue 21, 1993, p. 31. The next section of the chapter sent me on a number of research rabbit trails. On page 23 Missler discusses “Project Starlight,” a congressional briefing sponsored by the Center for the Study of Extraterrestrial Intelligence (CSETI) founded by Dr. Steven M. Greer. I had never heard of Greer before, so I was surprised to learn that he was “trained as a Transcendental Meditation teacher in 1975” and he founded “The Disclosure Project whose goal is to disclose to the public the government’s alleged knowledge of extraterrestrials.” CSETI’s organizational “goal is to initiate contact with extraterrestrials.” Over the years I had noticed how many New Age groups incorporated the mythological evil god “Set” (a reference to Satan) into their acronym. Now I was learning that many UFO organizations do this, too – a chilling fact. and also Sri Sri Sri Shivabalayogi Maharaj.” Greer was cited by Missler as an expert and the footnote reveals that Greer's quotation was taken from Art Bell’s Coast to Coast radio show – hardly a source of credible information. Coast to Coast, now hosted by George Noory, has been famous (or infamous) for its extreme paranormal fascinations, conspiracy theories, New Age channelings, occult activities, Bigfoot sightings, and general kookiness. In March 1993 Laurance, assisted by a former naval intelligence officer, reportedly met with Bill Clinton's science adviser to discuss UFOs and present a study entitled "Matrix of UFO Belief". It is alleged that, in August 1995, Laurance discussed the UFO issue at length with President Clinton at his ranch in Wyoming. From 1993 to 1995, Laurance provided US$500,000 to the CPSC, an organisation run by Dr John Mack, the Harvard psychologist who attracted enormous controversy with his endorsement of the alien abduction theory. Laurance paid for at least two meetings with the Starlight Group, an organisation comprising former intelligence officers and military personnel who shared an interest in UFOs. Laurance once funded a plan to establish contact with aliens, not by radio telescope but by signalling them with banks of powerful halogen lamps. Laurance also once held a UFO conference at his ranch in Wyoming. In 1995, Laurance provided US$30,000 to a project by the BSW Foundation, created by Marie "Bootsie" Galbraith, wife of investment banker Evan Galbraith and one-time US ambassador to France, to prepare a report on the most reliable evidence about UFOs. The report, titled "Unidentified Flying Objects Briefing Document: The Best Available Evidence" and prepared with the assistance of CUFOS (Center for UFO Studies), FUFOR (Fund for UFO Research) and MUFON (Mutual UFO Network), went to designated "leaders of the world" only. Table of Contents, Connecting Link, Issue 21, 1993, p. 3. Curious about O’Leary and his obvious New Age leanings, I discovered that he was the co-founder of this International Association for New Science (IANS), and his definition of “New Science” included “topics and phenomena which cannot be explained by traditional science and yet may have the potential for significant benefit to the health and conditions for humanity and the planet Earth.” O’Leary also founded the Institute for New Energy (INE) which promotes esoteric ideas about “inner energy.” His bio indicates his New Age experiential credentials. Toward the end of the decade of the 1970s, he began to have experiences which shook his assumptions about reality. A remote viewing experience, a near death experience, and a healing of an "incurable" knee led him into new territory which none of his scientific colleagues seemed to want to enter…. O'Leary believed there is an extraterrestrial presence on Earth, its relationship to those potentially transformative technologies, and their conjoined organized suppression. Interestingly, Willis Harman, leading Theosophist who was president of Edgar Mitchell’s New Age “science” group IONS (Institute of Noetic Science) for over two decades, gave a keynote address at one of Astronaut Brian O’Leary’s IANS forums. All of these men have been leaders in the “global mind change” agenda of the New Age movement. Their activities to explore “human consciousness” have led them to the frontiers of the occult, and guided the formation of the Emergent Church movement in evangelicaldom. This type of apocalyptic language and conspiracy mongering is a theme that continues throughout the rest of Alien Encounters. At this early point in my reading, I still had sincere hopes that Missler would go back to plain Bible prophecy and what Jesus told us about the end of time. I also found myself feeling a bit embarrassed by Missler’s continual use of less-than-credible sources. Surely a Christian leader of his caliber wasn’t going to continue to rely upon flagrantly New Age and unscholarly scientific sources. While zealously attempting to build the case that UFOs are real and pose a real threat to the planet Earth, Missler's documentation was so obviously based on pseudoscience and New Age Woo that it was discrediting him. But I was to become even more disappointed when I started into the next chapter…. Many of these sources employed by Chuck Missler in Alien Encounters involve reports from people who have been openly engaged in practices such as “remote viewing” or mediumistic “channeling.” These are occult techniques popular in the New Age Movement that are also related to clairvoyance. While it is true that the U.S. government was involved in many experiments with these occult practices, that does not make any of them credible, ethical, accurate or truthful. Some of the leaders in these experiments were seeking methods of altering the human brain and changing worldviews. This especially includes those at the Stanford Research Institute (SRI) such as Willis Harman, who had influence over evangelical leaders to change their eschatology. 1. Alien Encounters: The Secret Behind the UFO Phenomenon, by Chuck Missler and Mark Eastman (Koinonia House, 1997), pp 2-3. Foreword by Douglas James Mahr, author of Voyage to the New World, who describes himself a “friend, a colleague, advisor, mentor and pal to Shirley MacLaine,” and who claims he was “recruited” by the “channeled entity” Ramtha “to be his chief writer.” A friend who met Mahr personally informed me that Mahr could give no sound testimony of salvation. And sadly none is in evidence in the Foreword. 5. “Postmodern Prophecy Paradigm” (PPP) is a term the Discernment Research Group coined in an attempt to describe the new eschatological teachings. We refer to the leaders as PPP teachers. 6. Herescope has published many articles on this emerging prophecy paradigm over the past two years. For example, the previous post was 5th in a series: http://herescope.blogspot.com/2013/06/nephilim-are-from-mars.html and the “Quantum Mysticism” series which included: http://herescope.blogspot.com/2012/05/quantum-geomancy-and-cryptic-mystic.html. Reading these articles and following the links will take the reader to many of the previous articles. 8. Thomas R. Horn, Nephilim Stargates: the Year 2012, and the Return of the Watchers, Ch. 13, “Another Tower of Babel,” Anomalos Publishing, Crane, MO, 2007, p. 203, citing the speculative questions raised on page 275 of Alien Encounters. 9. Terry James, Ed., The Departure: God’s Next Catastrophic Intervention into Earth’s History, Ch. 8, Thomas Horn, “End-of-Days-Demons in High Places,” Defender Publishing, Crane, MO, 2010, p 399, footnote #124. 10. Thomas Horn, Apollyon Rising 2012, the Year 2012 and the Return of the Watchers, Ch. 9, “Will Modern Science Play a Role in the Coming of Apollo?,” Defender Publishing, Crane, MO, 2009, pp. 212-214. Most of this quote is exactly the same as the one that appears in Terry James’ The Defender cited above. 11. Thomas Horn, D.D., Pandemonium’s Engine: How the End of the Church Age, the Rise of Transhumanism, and the Coming of the Ubermensch (Overman) Herald Satan’s Imminent and Final Assault on the Creation of God, Ch. 1, “Pandemonium and ‘HER’ Children, Defender Publishing, Crane, MO, 2011, pp. 45-46. Most of this quote is exactly the same as the one that appears in the two sources cited above. 12. Thomas Horn, God’s Ghostbusters, Ch. 6, “Do Alien-Human Hybrids Walk Among Us?” Defender Publishing, Crane MO, 2011, pp. 146-148) Most of this quote is exactly the same as the one that appears in the three sources cited above. 13. L.A. Marzulli, Nephilim (online version), Zondervan, Grand Rapids, MI, 1999, Acknowledgments, pg. 8. 15. Peter Goodgame, “The Rapture According to New Age Channelers,” http://www.redmoonrising.com/newage.htm discussing pp. 185-200 and the Rapture theories proposed in Alien Encounters. 16. Steve Quayle, “ALIENS, FALLEN ANGELS, GIANTS & GENETIC NIGHTMARE,” Despatch Magazine, Vol. 21:2 July 2009 37, http://www.despatch.cth.com.au/Despatch/DESPATCH21-2.pdf citing pp. 14-17 of Alien Encounters concerning UFO sightings. 17. Noah Hutchings, Bob Glaze, & Larry Spargimino, Marginal Mysteries: A Biblical Perspective, “UFOs: The Marginal Mystery that is Becoming a Major Issue,” 2000, 2011, Defender Publishing, pg. 92, citing p. 55 of Alien Encounters. Missler’s Sethite theory that appears in Alien Encounters is also cited on pp. 89-90 of Hutchings’ book. 18. I saw UFOs. These experiences were repented of, with a long list of other New Age and occult involvement, shortly after salvation, under heavy conviction of the Holy Spirit. Note that in the 1970s UFOs experiences were included in exhaustive lists of occult activities from which former hippies, like myself, needed to repent, and renounce our former involvement. At the time it was acknowledged that what I saw might also have been high tech government experiments. But because I was deep into the New Age at the time and had ascribed occult meanings to this, I repented. 19. Alien Encounters, p. 7. Italics in original. 20. Searching for Iris Almagor on the Internet only indicates he was a Logistics Manager at MRV Communications in 1997-8, and an Operational Controller for MRV Communications in 1996-7. If he wrote as a freelance journalist during this time period, there is no adequate citation. See http://www.yatedo.com/p/Iris+Almagor/normal/b9233d5caccc89a7ddb5c92ad71f9f26 and http://www.scribd.com/doc/104386276/Hidden-Fields and http://mausoleum.internetarchaeology.org/page1.html, for example. 21. Alien Encounters, p. 9-10. 23. Footnote 8 refers to Connecting Link magazine, Issue 27, Spring 1995. 31. Ibid at the bottom, under the subtitle, “THE SOURCE.” It is evident from the context, that these purported alien entities are self-describing. 36. Alien Encounters, p. 15, footnotes 15-17), citing “UFO Reality, Issue 6, February/March 1997, pages 10 and 11. 39. “Mideast Paranormal Roundup,” webpage includes “The Plain Dealer March 31, 1996 ISRAEL IS HOT SPOT FOR UFO SIGHTINGS By DANIEL BRYNBERG; JERUSALEM REPORT,” at http://www.mt.net/~watcher/sitings.html, and some of it is here, “Aliens in the Holy Land,” http://www.aj6.org/jpbo/302/page2.html. 41. See http://en.wikipedia.org/wiki/Phoenix_Lights, www.youtube.com/watch?v=ymCmI-MvIeU, www.youtube.com/watch?v=wFWMc1RmepA and www.youtube.com/watch?v=mcbQOIr0pLk, for example. 42. See “The Phoenix Lights,” by Steve D. Am., March 13, 1997, posted at http://www.ufodigest.com/phoenix.html. 43. Alien Encounters, footnote 27 on page 344. 44. Alien Encounters, p. 21. 45. http://en.wikipedia.org/wiki/Project_Starlight. See a description of the CSETI project here: http://www.bibliotecapleyades.net/sociopolitica/sociopol_projectstarlight.htm. 51. Alien Encounters, footnote 30. 52. See, for example, http://en.wikipedia.org/wiki/Art_Bell. Unfortunately many of the PPP leaders have appeared on the Coast to Coast show. 53. Warren Smith wrote about this in Reinventing Jesus Christ: The New Gospel, Chapter 2, citing The Revelation by Barbara Marx Hubbard, p. 350. 54. Will Banyan, Nexus Magazine (Vol. 11, No. 2), Feb.-Mar. 2004. Article archived at: www.nexusmagazine.com. A special thanks to Dr. Martin Erdmann for calling this to my attention. 57. Ibid. Note that this article also states that Rockefeller funded New Ager Brian Swimme, stating: "Laurance gave the CIIS, for which he is an Honorary Trustee, a grant of US$190,000 for the Institute's 'New Story of the Universe' project. According to the CIIS website, project co-ordinator Professor Brian Swimme 'sees the amazing the story of the unfolding universe as one that has the potential to unite people of all traditions and faiths'. Swimme himself was quick to thank his benefactor and make the bold claim that his effort to create a 'new story of the evolving universe' by combining existing religious and scientific accounts of creation would 'serve as a link in creating an organizing mythic framework for the new millennium'." 59. Marilyn Ferguson’s landmark 1980 book, The Aquarian Conspiracy: Personal and Social Transformation in the 1980s (J.P. Tarcher) explains that changing mindsets and worldviews is the primary directive of the modern New Age movement. Constance Cumbey warned evangelicals about this New Age deception in her landmark book The Hidden Dangers of the Rainbow (Huntington House, 1983. 64. Alien Encounters, p. 30, quoting O’Leary’s report. 69. Alien Encounters, p. 27. 75. Missler offers the audio track in his “The Return of the Nephilim” package that he sold at the time of his book’s publishing. But one can listen to it here: http://www.youtube.com/watch?v=ygaICCH0s9w. 76. Alien Encounters, p. 31. 80. Alien Encounters, pp. 31-32. 86. See documentation at footnote 74. 87. Constance Cumbey, The Hidden Dangers of the Rainbow: The New Age Movement and Our Coming Age of Barbarism (Huntington House, 1983), p. 25. 1. 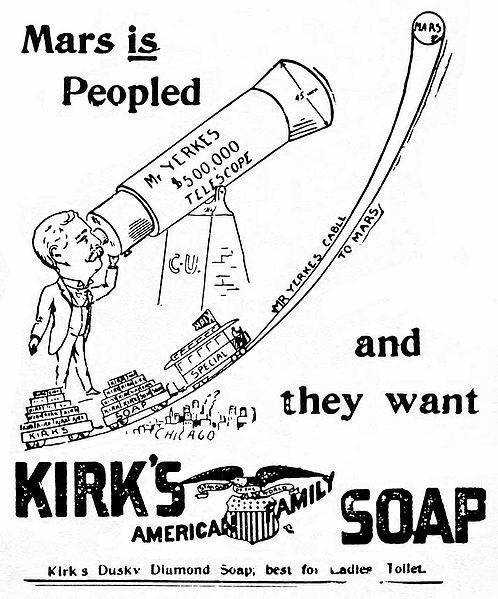 "An 1893 soap ad playing on the popular idea that Mars was populated." [T]he fall of satan [sic] and other wicked angels… was from a destroyed planet — alternatively named Rhab, Asteria and Krypton — and from its closest planetary neighbor — Mars. In the last four installments of this article series, we explored several key tenets of the Postmodern Prophecy Paradigm (PPP). All of these unbiblical PPP teachings share the shifting foundation of an emerging False Nephilim Eschatology—the invention of a new endtime prophecy scenario relying upon an unlimited variety of extrabiblical sources, past and present, even including ancient mythology. Modern science fiction and pop-culture conspiracy theories are also not off limits, both which form the foundation for the PPP teachers’ incredible thesis that the planet Mars has been an off-site staging area for Nephilim invading the earth! Besides the obvious heretical and unbiblical foundations for these postmodern prophecy teachings, these wild conjectures are also undergirded by false science. This is what the Bible calls “science falsely so called.” Or, in plain English, pseudoscience. What is pseudoscience? Pseudoscience is a claim, belief, or practice which is presented as scientific, but does not adhere to a valid scientific method, lacks supporting evidence or plausibility, cannot be reliably tested, or otherwise lacks scientific status. Pseudoscience is often characterized by the use of vague, contradictory, exaggerated or unprovable claims…. Many who believe in extraterrestrial life do so because of evolutionary presuppositions that life could evolve anywhere conditions are right…. [They] look to outer space for the biological and technological underpinnings of the human race. Yet, aside from their lack of credible evidence for the existence of these alien forefathers, they still offer no explanation for the origin of the aliens. If human origins are a puzzle, then alien origins become a matter of the wildest conjecture. This article will examine how the PPP leaders alter the early chapters of Genesis, and then how they connect this revised history to their endtime space alien scenarios. Scripture says nothing about this. What does Scripture plainly teach? God—the Creator—made everything out of nothing by speaking it into being (Ex. 20:11; Ps. 33:6, 9; Isa. 45:12). The finished product was “very good”—because the Lord God had made it! The Bible states that from Genesis 1:1 to Genesis 2:4, Elohim, the Creator, “created,” “said,” “saw,” “divided,” “called,” “set,” “blessed,” and then “ended His work” and “rested on the seventh day” (the end of one week) because His great and good work was completed, done, finished. According to this passage, in plain straightforward language, the Lord God created the days, nights, sky, land, sea, sun, moon, stars, creatures, etc., to accommodate mankind who would inhabit the earth. Mankind was created for the purpose of serving, obeying, and worshiping his Creator. This is the context for the opening passages of the Bible. Note that God did not furnish any specifics regarding the angelic realm because they are NOT the subject and thrust of these Scriptures. God has spoken and has given us in His Word what we are to know. Those who choose to go beyond the parameters set by God, in order to discover things that He has not written, do so at their own peril. Why is the Gap Theory such a pivotal issue? Many of the PPP leaders have embraced the Gap Theory in an attempt to prop up their false Nephilim eschatology—specifically in nailing down the time frame of Satan’s fall and the so-called first appearance of Nephilim creatures. The Gap is no longer recognizable. The Gap has now become a gaping chasm into which PPP teachers pour an incredibly diverse array of extrabiblical speculations. But the Scripture does not teach “a re-creation of the earth” as Pastor Larry has shown in his careful analysis of this issue. The fact that many other notable Christians past and present believe this error does not make it biblically true. Nonetheless, besides Marzulli, both Tom Horn and Gary Stearman also promote the idea that the Gap Theory is a viable teaching. This is because it forms a necessary foundation for their emerging endtime eschatology. During an interview with Horn on Stearman’s Prophecy in the News (PITN) broadcast last September, both authors affirmed the possibility that the earth was “re-created”—after the fall of Satan and before the Watchers (fallen angels) came down to produce the Nephilim by mating with human women. But as Pastor DeBruyn so carefully explained in his analysis of the Genesis 1:2 grammar (above), the “straightforward language” in this text teaches that Elohim (the Creator) “did not create the earth… to be uninhabited.” Clearly, Missler has misapplied the passage in Jeremiah to squeeze it into the Gap Theory. After listing various Christian proponents of this theory, Missler repeats its controversial nature and then adds, “It [Gap Theory] does seem to link a lot of different passages.” In the video clip, Missler finishes his teaching by offering several conjectures regarding the timing of Satan’s fall—hinting that it took place between Genesis 1:1 and Genesis 1:2. It seems that Missler also needs the Gap Theory in order to prop up his similar endtime eschatologies, as shall be shown. Reality check: Do fallen angels live on Mars!? The Gap Theory became a huge gaping abyss for Flynn to pour in all sorts of suppositions and conjectures—such as Satan falling from “a destroyed planet—alternatively name Rahab, Asteria and Krypton.” DC Comics fans will recognize that Superman originated from the planet Krypton, a “fictional planet in the DC Universe”! When Satan and his angels rebelled, God destroyed their literal dwelling places. According to scripture this destruction was swift and decisive. The fifth terrestrial planet which God calls "Rahab" (boaster, pride), was obliterated. God brought a fire out of Satan's midst, in the center of his greatest planetary kingdom. The planet Rahab exploded sending pieces of itself into the orbits of the interior terrestrial worlds. Asteroid impacts on the surface of mars [sic] rocked the planet, oceans washed over its dry land. The martian [sic] atmosphere was blasted into space. Note that Flynn refers to “Adams” (plural) rather than Adam (singular), thus betraying he does not believe in the literal creation of Adam and Eve in Genesis. Many other PPP leaders similarly waffle on the literal Adam. Flynn is not alone in enlarging the Gap Theory wide enough to accommodate truckloads of additional extrabiblical and pseudoscience beliefs, including alien beings living on Mars. Others also use the Gap for trafficking their novel eschatological ideas. Lucifer Lives in Cydonia’s Face? This teaching—that physical monuments such as the pyramids, were built by an earlier civilization that pre-dates the biblical Adam or modern man—can be traced to Theosophical cosmology. The Theosophists taught the very offensive “Root Race” mysticism which credited early earth civilizations, such as the Lemurians (Third Race), with building “stone edifices” and “monumental images,” such as the pyramids in Egypt. The Theosophists connect the Egyptian pyramids in many arcane ways to the planet Mars. Throughout the remainder of this article note how many times Mars is similarly connected to Egypt in the quotes by the PPP leaders. Why are they teaching this? 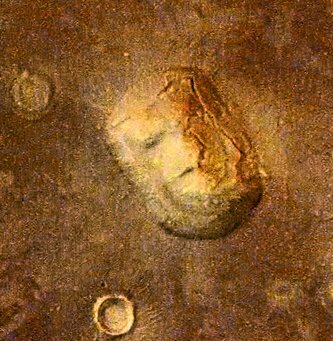 “Close to the Cydonia Face on Mars is a similar five-sided pyramid with detailed buttressing suspiciously positioned at 1/360th of the Martian polar diameter from the Face. In the same area, other structures form a perfect equilateral triangle in what some experts at NASA are now calling ‘the city complex.’” Copiously scribbling the Bishop’s thoughts as he spoke, Jones said, “I wasn’t aware of the city complex, but the qualities of the enormous face are astonishing. Eyebrows over eye sockets with pupils. A parted mouth with lips and teeth. A nose tapered back toward the forehead. A crown strikingly similar to those worn by Egyptian and Mayan royalty.” Jones had done his homework before calling the scholar. Renaldo agreed. “Indeed, Mathematicians have postulated the chances of the face arising by chance at a thousand billion, billion to one, so it is significant.” “Significant enough to convince you it’s real?” Jones had asked. “So you believe, tenuously I take it, that cities on Mars might actually have existed, and that these were abandoned during a pre-Genesis war between Good and Evil?” “I’d go a step further. Take note of Horn’s deceptive disclaimer to the reader following his fictional detour through The Ahriman Gate: “Though fiction, the above dialogue is based on accepted theology concerning Lucifer and the possibility that the location from which he fell was a star system or planetoid.” This so-called “accepted theology” was part and parcel of the fiction he just presented in the preceding narrative! Also key is the fact that Horn does not cite any biblical text here, nor does he offer any footnoting in the entire book. In the back of Nephilim Stargates, on page 228, Horn includes Flynn’s Cydonia: The Secret Chronicles of Mars as one of the works cited. One of the features of pseudoscience is that the lines between fact and fiction become blurred. Clearly, the references to Krypton, a purely fictional creation in the DC Comics “Universe” (and Hollywood), indicates how far from reality these PPP teachers will veer. But what about Cydonia? What is it? Here is a brief science lesson. Above is the image of the “Face on Mars” that has so much esoteric significance to Flynn and Horn, et al. This is a “cropped version of the original batch-processed image (#035A72)” taken by Viking 1 on July 25, 1976 depicting the 1.2 mile long Cydonian mesa, situated at 40.75” north latitude and 9.46” west longitude. A second image, 070A13 also showed this face at a different sun-angle. These images taken in 1976 had poor resolutions (pixels) by modern standards. UFO speculators have engaged in many wild theories about the early Martian landscape photos that came via Viking 1. Of course, when the higher-resolution Mars mission scientific photos were released, disproving the “face in Mars” theory, Hoagland at first accused space officials of fraud. Later he resorted to claiming that it wasn’t natural geology. No matter what scientific proof came forth, it became part of Hoagland’s conspiracy theory about a cover-up. Hoagland’s bio on Wikipedia has a very long list of his deviant pseudoscience beliefs, much of which he has popularized via alternative media outlets such as Coast to Coast radio. Hoagland is so noted for his bizarre pseudoscience theories that he has even been the subject of satire and parodies. Nevertheless, Hoagland is treated as though he were a credible authority, and he seems to have inspired many of the space alien and government cover-up conspiracy theories touted by Tom Horn and his fellow PPP teachers. Idols are not made from scratch. It involves the distortion of already present truth. The truth is changed into a lie. The lie depends upon the truth it is distorting for its power, just as the counterfeit depends upon the authentic for its value. Our idols of God contain truths within them, making them all the more seductive to us. I think the new Cydonia photo might be more serious for David Flynn since he had attached a few theological ideas to the “face” (but it doesn’t need to be). Dave is very gifted and, in my judgment, a valuable resource as a thinker…. My hope for Dave is that he will be willing to dispense with the “face” and focus on what I’ve always wished he’d focus on: occult history and — more importantly — doing what is necessary to teach that history to a popular audience…. The implication in Heiser's remarks is that the occult world has something to teach Christians. That we should be referring to an occult hermeneutic and sacred geometry in order to decode Scripture. This morbid fascination with the occult is becoming the operating system for the PPP teachers. But I wanna—since we’re on the planet Mars, I wanna share some things with you that you might find interesting and maybe this is old news for you. This is a blow up of something that occurred on, uh, Viking 1, orbit number 35. It encountered on a large, flat plain—this peculiar structure. It’s called, ‘the face on Mars’. It’s a structure that’s about a mile across. It’s a structure that is possibly, many people argue, is just a strange aberration by just the accident of meteor hits or whatever. But more and more people who have studied it are bothered by that—for, cause it has some strange features…. If you can imagine putting on your science fiction hat for the moment, that you’re part of an inter-galactic mission, you’ve been travelling for light years with no gravity or artificial gravity, if any. And you are coming into our solar system. The outer planets are gaseous and, uh, not firm. The inter planet Mercury is 900 degrees Fahrenheit it’s a cool day. It’s not very hospitable. Venus has its problem being mostly, uh, ammonia, methane and, uh, it’s not a very hospitable place. The place that’s most desirable—which has the richest array of elements in free supply on the planet is the planet earth. But it’s got a substantial gravity. And so the hypothesis is that such a mission would probably land on Mars despite the fact it’s an arid desert with nothing but UV radiation—and extreme temperature changes. Very inhospitable in many ways, it could be a place to get used to a gravitational environment about a third that of the earth before going to the earth. Like Horn, who imbeds many of his fantastically false ideas into his best-selling books via fictional fantasizing, Missler utilizes the “conjecturing” method to introduce all sorts of heretical doctrines and strange ideas—like the possibility that “the earth seeded Mars”—into his teaching! He is not refuting panspermia, he is entertaining it! In other words, the Word of God is insufficient to furnish us with the truth about God’s Creation of the cosmos—including mankind and the angelic realm. We must instead turn to cosmology “cryptologists” like Chuck Missler in order to interpret secret coded “records left by lost civilizations”—like perhaps the fallen angels or their offspring who left archeological ruins on the planet Mars! To add weight to his contention that “a pictorial approach has the appeal of concreteness,” Missler includes the debunked “Cydonia Face on Mars” photo (taken from the 1976 Viking 1 spacecraft) on page 35 of Cosmic Codes. “Fascination With Mars” is another title of an article posted on Missler’s Koinonia House website, which articulates similar views about Mars. Dolphin Lambert, the author, speculates that some of the features on Mars may be indicative of “some ancient civilization on Mars” and bear “muted evidence that intelligent beings once lived there.” In conclusion, despite the overwhelming scientific evidence about Mars, PPP leader Chuck Missler is still perpetuating—rather than debunking—the pseudoscience and conspiracy theories. 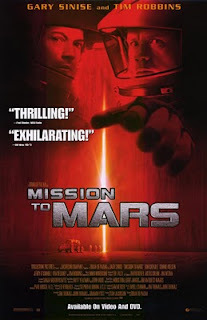 In the case of Tom Horn and his co-author Cris Putnam, Hollywood movies can also be used to perpetrate these seductively false Martian cosmologies on unsuspecting Christians. In their latest best-selling book, Exo-Vaticana, the authors not only give credence to the myth that fallen angels once lived on planets in the solar system—with Satan serving as a one-time intergalactic ruler—but also give credibility to supposed alien structures on the Cydonian face on Mars. Note that despite the current scientific evidence, these teachers are still perpetuating unscientific frauds. In other words, “Xenoarchaeology” is a pseudoscience “that exists mainly in the works of science fiction.” It is a fitting word for the chapter which opens with a full-page DVD graphic of the Disney movie Mission to Mars starring popular actors Gary Sinise and Tim Robbins. David Flynn's book Cydonia: The Secret Chronicles of Mars has a different take on the masonic hermetic credo "As above, so below", discussing among other things, the beyond-coincidental re-occurrence of Sidonia/Cydonia references in ancient science and mythology. 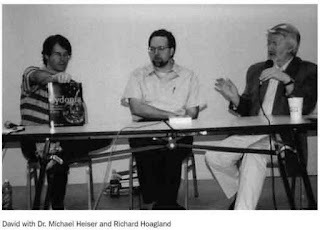 Richard Hoagland was among the first to read "Cydonia", and praised Flynn's research at the Roswell UFOs & the Bible conference in 2003 (with Mike Heiser & Hoagland, DVD lectures available…). Note that “as above, so below,” is also an integral part of the cosmogony of Theosophy, and was written about in The Secret Doctrine by Madame Blavatsky. Hoagland’s inspiration includes astronaut Brian O’Leary, who was trained as a scientist but broke away into the New Age movement after remote viewing, near death and healing experiences. O'Leary's books Exploring Inner and Outer Space and The Second Coming of Science discuss UFOS, and “the face of Mars (popularized by Richard Hoagland), crop circles, near death experiences, reincarnation, healing, psychokinesis, mind over matter, Earth energies and the latest theories on physics and consciousness.” Note: Many of the items on this occult list are also taught by the PPP leaders, which raises further disturbing questions about where they are getting their information. Christianity is totally incompatible with “occult mythology and zodiacal and processional phenomena (astrology)”—which the Bible declares are forbidden realms to the Christian (Deut. 18:10-12; 29:29; Isa. 47:12-14; 1 Tim. 1:4; 2 Tim. 4:4). Sadly, Flynn, also a Gap Theory proponent, could have only become an “expert” in such strange “anomalies” by departing from the Scripture and devoting himself to the study of arcane and occult phenomena—themes which have permeated his writings and pollute the Word of God. These PPP teachers admit that they are going outside of Scripture for their source material. They are borrowing heavily from some of the blackest occult sources. In fact, one of the most important aspects of widening the Gap in the Gap Theory is the subtle synthesis of Theosophy (and other evolutionary occult religions) with Christianity. This synthesis permits a new eschatology to be birthed, one which is perfectly compatible with all of the world religions. While protesting to be biblical, the PPP teachers add in pseudoscience, metaphysics—specifically the cosmology of Theosophy. In an article subtitled “The Pyramids of Mars and Egypt Linked?” Doug Woodward, a leading PPP teacher, cleverly asked provocative questions concerning the beliefs of Richard Hoagland. He challenges the biblical worldview by suggesting there are connections between Mars, the Egyptian pyramids and a pre-Adamic race. The great system of canals which has been observed by terrestrial astronomers was constructed by the second order of moon-men when they last occupied the planet…. Leadbeater, like many of the other Theosophists at his time, claimed clairvoyant and psychic abilities, including the ability to engage in celestial travel and receive channeled transmissions from higher beings. This is how he says he obtained his information for his book “The Inner Life, in which he wrote that there is a population of human-like beings on the planet Mars.” In fact, much of the information about these arcane landforms on Mars come via occult channeled transmissions. That doesn't appear to stop the PPP leaders from using this information and treating it as though it were a credible source of factual information. Again, pseudoscience and metaphysics blend together. What are “The Nines”? According to a May 27, 2012 San Jose Mercury News article, it is “a reference to the so-called nine extraterrestrials from the star Sirius that British psychic Jenny O’Connor said she ‘channeled.’” And who is Hurtak? A later proponent of the same theosophical theories about the connection between Mars and Egypt, described as a “Social scientist, futurist and remote sensing specialist.” Here is yet another man who claims psychic abilities for remote viewing of extraterrestrials on other planets. He referenced the Enoch theories early on, even claiming a visitation from Enoch! This raises more unsettling questions. To what extent have his writings influenced the postmodern prophecy teachers? Following the rabbit trails in researching the roots of these strange and unbiblical PPP teachings about Mars leads into some very dark, scary and sinister places. We seldom, if ever, find any references about Jesus Christ and His Saving Grace for lost souls in any of this horrid material. Where is Jesus? Where is mention of his glorious Second Coming? Where are the calls to share the Gospel before He returns in judgment? This flagrant omission (or demotion in emphasis) should be a huge red flag. So that’s what this is all about! Changing our belief system and worldview. Believers beware! As has been demonstrated in this article, the Gap Theory has become so broad, so wide, that these teachers are driving every sort of heresy through its broad way opening. The emerging eschatology versions of the expanded Gap Theory accommodates all sorts of wild suppositions regarding Satan’s fall, the Watchers, the Nephilim, and elaborate speculations about an alien outpost on the planet Mars. None one of these things, however, are found in the Scriptures. These teachings can, however, be found in Theosophical and occult religions. Metaphysics, pseudoscience and wild unprovable conspiracy theories are being poured into the ever-widening chasm of The Gap at an accelerating rate. These heresies are pouring through the Gap and coming into the church like a flood. The Postmodern Prophecy Paradigm (PPP) teachers rely on their “secret opinions” and “hidden meanings” to build their case that there is a scary emerging eschatology for the church world, one that focuses more on space aliens than Jesus Christ and His salvation for a lost world. They give equal prominence to their extrabiblical sources, believing that these additional teachings are revealing hidden things in God's Word. But we don't need to run to the occult to get spiritual answers. Since when are demonic channelings truthful sources of information?! The questions then become quite obvious: How far can the Gap Theory expand to accommodate all of this extrabiblical metaphysics and pseudoscience yet still retain its former respectability? How far are evangelical leaders willing to go in tolerating this extreme sort of heresy? When is it time to biblically separate from these PPP teachers, deeming them false, and warning others? 1. Steve Eastman, “A Review of David Flynn’s ‘Cydonia: The Secret Chronicles of Mars’,” Faith Issues, 2012; http://www.faithissues.com/page/478170653. Bold and color added. 2. This is the incredible concluding statement made by L.A. Marzulli, “Life On Mars… What Are We Dealing With?” 8/4/08, http://www.lamarzulli.net/blog/?p=166. Bold and italics in original. Note how far the speculations can go. 3. This particular thesis of the PPP teachers has been satirized at Pastor Ken Silva’s website apprising.org with the on-going adventures of Nephy Lim, who at the present moment is stuck on Mars since he was unable to conquer Earth on 12-21-12. See, for example, http://apprising.org/2012/12/24/nephy-lim-reports-in-finally-from-mars/, and follow the links to satires such as http://apprising.org/2012/12/18/nephy-lim-stuck-in-outer-space-trapped-in-a-wormholeportal/ and http://apprising.org/2012/12/21/nephy-lim-still-hasnt-arrived/. If you are a big fan of Nephy Lim and Ken Silva's ministry, Ken needs your help. Go to www.apprising.org and read the letter posted there and help him out in his hour of need. 5. This word pseudoscience is derived from the Greek “combining form of pseudḗs false, pseûdos falsehood,” and Latin “scientia knowledge,” http://dictionary.reference.com/browse/pseudo- and http://dictionary.reference.com/browse/science. 8. John Lash, The Seeker’s Handbook: The Complete Guide to Spiritual Pathfinding (Harmony, 1990), pp. 321. This book is a dictionary of the New Age occult. Note that this author, John Lash, is mentioned in Part 2 of this series because LA Marzulli listed him as a credible source information about "archons." 10. Esoteric Cosmology is defined at http://en.wikipedia.org/wiki/Esoteric_cosmology. 13. See: Pastor Larry DeBruyn, “The Gap Theory: A Review and Grammatical Critique – From Cosmos to Chaos, and Cosmos Again”, Herescope, Feb. 22, 2013; http://herescope.blogspot.com/2013/02/the-gap-theory.html. 14. See: http://en.wikipedia.org/wiki/Gap_creationism and follow the many links to Thomas Chalmers, William Buckland, etc. Unfortunately the Gap Theory was most notably popularized by its inclusion in the Scofield Reference Bible. 16. See: Marzulli’s blog, “Sunday Go To Meeting Bun: Jesus would believe in Evolution? I think not!” April 10, 2011; http://lamarzulli.wordpress.com/tag/giberson/. 17. See: YouTube video of the PITN broadcast with Horn & Stearman, “Earth’s Earliest Ages”, Sept. 26, 2012 (from the 6:12-7:11 and from the 22:50-23:40 minute marks); http://www.youtube.com/watch?v=G2xhQug56aI . 18. See: Chuck Missler teaching video, “Gap Theory, Fall of Satan – Part 2 of 4”, YouTube, Sept. 28, 2008 (about the 00:45 minute mark); http://www.youtube.com/watch?v=Mx-UDIvkfvo. 19. Ibid. Quote about the 3:05 minute mark). 20. Sadly, David Flynn died January 22, 2012 at age 49, after a short bout with brain cancer. See: http://www.redicecreations.com/article.php?id=18326. 21. Cydonia: The Secret Chronicles of Mars was recently republished as part of The David Flynn Collection by Tom Horn’s Defense Publishing. See Amazon.com (Horn also wrote the Foreword); http://www.amazon.com/The-David-Flynn-Collection-ebook/dp/B008K50ZDO. See also Amazon.com for Flynn’s Cydonia book; http://www.amazon.com/dp/0972134719. 22. See: Steve Eastman, “A Review of David Flynn’s ‘Cydonia: The Secret Chronicles of Mars’”, Faith Issues, 2012; http://www.faithissues.com/page/478170653. 23. http://en.wikipedia.org/wiki/Superman and http://en.wikipedia.org/wiki/Krypton_(planet). Pastor Ken Silva posted a satirical article on Flynn’s teachings on Mars/Krypton; See: http://apprising.org/2012/08/29/on-cydonia-the-secret-chronicles-of-mars/. 24. See: David & Mark Flynn’s website: “Asteroids, Comets, Rahab & Mars, Cherubim & the Megaliths of Cydonia, The "Stones of Fire " and Pre-Adamite Civilizations, and Satan's Secret History and the Monuments of Mars; http://www.mt.net/~watcher/luciferandmars.html. 26. See: 10-minute audio clip of Tom Horn & Steve Quayle on Quayle’s radio program (The Q-Factor), “Dark Deception”, Quayle 6/6, Vol. 3 of 5, Sept. 10, 2008; http://www.youtube.com/watch?v=BVoaNl_DPyM. 27. Tom & Nita Horn, The Ahriman Gate, Musterion Press (a division of VMI Publishers), Sisters, OR, 2005; See: PDF version; http://hell.pl/agnus/AhrimanGate.pdf. 28. See: Thomas Horn, Has Outpost Alpha From The Ahriman Gate Been Discovered?” Raiders News Update (RNU), June 9, 2011; http://www.raidersnewsupdate.com/outpostalpha.htm. 30. This was the topic of an article published in the Theosophist Magazine by Walter Owen titled “The Pyramids and Ancient Monuments,” reproduced on page 291 in The Theosophists: A Magazine of Brotherhood, Oriental Philosophy, Art, Literature and Occultism, edited by Annie Besant, Vol. XLIV, Part 11, April to September, 1923. This rare reprint was republished by Kessinger Publishing. See also http://en.wikipedia.org/wiki/Lemuria_(continent) and http://en.wikipedia.org/wiki/Root_races but note that there are many variations on this Theosophical cosmic theme. 31. Thomas R. Horn, Nephilim Stargates : the Year 2012 and the Return of the Watchers, Anomalos Publishing, Crane, MO, 2007, excerpts from Chapter 4, pg. 48-52, “Fallen Angels, Ancient Mythology.” The book is currently being republished to reflect the new date focus of 2016 since nothing happened in 2012. 32. Ibid. See listing as it appears in Nephilim Stargates: David Flynn, Cydonia: The Secret Chronicles of Mars, Bozeman, MT: End Time Thunder Publishers, 2002. – E-mail to Tom Horn, 2005. 33. See: Thomas and Nita Horn, The Ahriman Gate, Musterion Press (a division of VMI Publishers), Sisters, OR, 2005; PDF copy; http://hell.pl/agnus/AhrimanGate.pdf. 34. Cydonia (region of Mars) on Wikipedia, http://en.wikipedia.org/wiki/Cydonia_(region_of_Mars). Britt, Robert Roy (March 18, 2004). "Scientist attacks alien claims on Mars". CNN. SPACE.com. Retrieved October 12, 2007. 44. 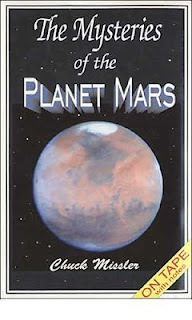 See Missler’s website: Koinonia House 66/40 Radio Broadcast, “The Red Planet and the God Of War - The Mysteries of the Planet Mars – Part 5” (from the 9:00 to the 14:15 minute mark); http://www.khouse.org/6640/BP047/. 47. Missler is still teaching this. See the Koinonia Institute Handbook, PDF pg. 55; http://www.studycenter.com/downloads/KI_Handbook.pdf, p. 109 in the text. 48. Dr. Chuck Missler, Cosmic Codes: Hidden Messages from the Edge of Eternity, Koinonia House, Coeur d’Alene, ID, 1999 (Revised Ed. 2004), pg. 27. Note that Missler expands on all of these UFO and Nephilim themes in his 1997 influential book Alien Encounters. 49. Ibid. Missler’s Cosmic Codes, pp. 34-35. 50. We have examined Missler’s unbiblical teaching of cryptology in our Quantum Mysticism series; See: Gaylene Goodroad, Cosmic Cryptology in the Church: Cosms, Codes, and Cryptologies Part 2; Herescope, May 14, 2012; http://herescope.blogspot.com/2012/05/cosmic-cryptology-in-church.html. 52. Cris Putnam and Thomas Horn, Exo-Vaticana: Petrus Romanus, Project L.U.C.I.F.E.R., and the Vatican’s Astonishing Plan for the Arrival of an Alien Savior, Defender Publishing, Crane, MO, 2013. 53. See: Wikipedia entry for Xenoarchaeology; http://en.wikipedia.org/wiki/Xenoarchaeology. 54. Ibid. Exo-Vaticana, pg. 480. 60. See: Hoagland’s synopsis; http://www.enterprisemission.com/IntelligentDesignandGod-Man-and-ET.htm. 61. See definition of “mythologist” on Dictionary.com; http://dictionary.reference.com/browse/mythologist. 62. See the God, Man & ET conference advertisement featuring Flynn, et al: http://www.newscienceideas.com/page/UT/PROD/new-releases/K552. 63. See: Gaylene Goodroad, “Quantum Geomancy and Cryptic Math - Cosms, Codes, and Cryptologies Part 6,” Herescope, May 26, 2012; http://herescope.blogspot.com/2012/05/quantum-geomancy-and-cryptic-mystic.html; “Quantum Prophecy Part 7”, May 30, 2012; http://herescope.blogspot.com/2012/05/quantum-prophecy.html; and “Quantum Mysticism Goes to Market Conclusion,” June 5, 2012; http://herescope.blogspot.com/2012/05/quantum-prophecy.html. 73. Ibid. It should be noted that Woodward suggests near the end of this very speculative piece that all of this is a “myth.” Yet, one does not find any evidence that he believes it is a myth while reading the article. 75. Julia Prodis Sulke, “Bad Karma in Big Sur: New Agers wage war for soul of Esalen,” San Jose Mercury News eEdition article, May 25, 2012, page A01. This fascinating article delves into the New Age history of Esalen Institute. This quote is referring to the controversy that erupted when Esalen hired this psychic channeler in 1979 to contact extraterrestrials for advice on reorganizing management. 80. Geoffrey W. Bromiley, Theological Dictionary of the New Testament: Abridged in One Volume (Grand Rapids, MI: William B. Eerdmans Publishing Company, 1985): 644. A special thanks to Pastor Larry DeBruyn for assistance with this point. 5. Flynn, Heiser and Hoagland photo image can be found in many locations including: http://www.mt.net/~watcher/contact.html and http://www.youtube.com/watch?v=MZpQW_aWQcA and satirically at http://apprising.org/2012/08/29/on-cydonia-the-secret-chronicles-of-mars/. It was also widely distributed via Tom Horn's Raiders News Network during August 2012 under the heading "A Review Of One Of The Books In The New David Flynn Collection -- Cydonia: The Secret Chronicles of Mars" which Horn is marketing. 6. This conference is discussed at this webpage: http://www.enterprisemission.com/IntelligentDesignandGod-Man-and-ET.htm. See also: http://www.newscienceideas.com/page/UT/PROD/new-releases/K552 "GOD, Man & ET: The Question of Other Worlds in Science, Theology, and Mythology - 6 DVD Set"